Board chairs are granted a unique role in setting the boardroom agenda. With the privilege of leadership, they are accountable for leading change in their boardroom and supporting their CEO to focus business strategy on the future. 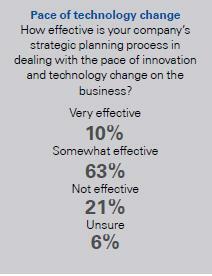 The KPMG 2011 Audit Committee Institute Spring Roundtable polled over 1,500 directors on managing technology risk. Click the link for the self-assessment. Although almost 75% of the ACI responses suggest “we’re on top of technology’s rapid change,” I’m seeing a different picture emerge. BRANDFog, a C-Suite advisory firm for the web’s social media says for executives “If You’re Not Online, You Don’t Exist”. As a board chair, it is important to have directors focused on what your CEO is doing/not doing on the web relative to reputation and brand management. This all reflects on the board’s reputation, especially in the eyes of investors and stakeholders. So, how is a board chair going to bridge this disconnect between stakeholders, their CEO and their board with their own limited knowledge of how it works? Yes, we can write white papers and frame up questions for the boardroom. I believe it begins with a private conversation with the board chair to hear about their beliefs around technology. Last week, I attended a “private event” that convened a dinner table with directors, academics, professional advisors and institutional investors from marquee brand firms. I was wearing two hats: as a board member for NACD Southern California and as an independent advisor to board chairs. I was also there to share my experience as a risk expert engaged with the Twitter corporate governance community. I also got a chance to see some beliefs expressed about social media, risk and asymmetrical information that, when expressed in public, are the equivalent of a “your zipper’s down” moment. @fayfeeney @DougYPark is it any wonder hacking, privacy, business interruption, IT investment risk is so poor? So, what can be done to save a board chair from embarrassment? Remember, if it is done right, you’ll go up a notch for your nerve and for limiting personal exposure. Find a way to let them know that this belief that they don’t need to learn about social media and technology negatively represents their brand and could hurt their personal reputation as a leader. Think for a moment, as if it were you. Would you rather someone tell you, or just pretend nothing was awry? We would all like for someone to alert us in a way that was discreet and didn’t make us feel like it was a major focus of attention. a. This might be time for you to call in support. I consider it an honor to meet with board chairs. I find a meal together makes this an easier conversation. Telling someone their “digital zipper” is down is best done while breaking bread. b. Print this post and leave it in the chair’s in-basket or have it sent as a pre-briefing to the board meeting. These conversations require willingness for the board chair to see that the world is changing. Accepting the change begins with leading the way for new thinking. My approach is to listen to the belief usually around changing (no time, not important, someone else knows about it, I get my information by management, I get emails, etc.). Susceptibility: belief that not focusing on technology risk on their business could cause loss. Severity: consequences of not taking action are serious enough to be avoided. Barriers: institutional, people, resources, resistance to change, belief and attitudes, education, training, etc. Benefits: connecting to real-time data and extending relationship reach are necessary for future strategy and performance. Our next step to engage is to get the board chair to consider replacing the beliefs we identified with a willingness to see “how it works”. This includes a personal tour of Google and other social networks specific to them, their board, company and competitors. This is a time of great change for all of us. Some of us are faster and others are taking their time. For all, this is just the beginning and not too late for anyone to grasp the fundamentals. It reminds me of boarding a plane; we all take off together at the same time. However, you do need to get to the airport to board. The mistake to avoid is to not say anything. The cost of not telling could be high if it appears that you knew and kept quiet. Good leaders want feedback to improve their performance. So, here’s hoping all your “digital zippers” are right where you want them. In today’s global, 24/7, digitally-connected work, you want to be connected to what is being said on social media about you, your board or your industry. If you need me to deliver the news to your board chair that your “digital zipper” is down, call me at 310-902-3727 or email me at fay@riskforgood.com. Want a terrific list of who to follow on Twitter for #corpgov ? @LucyMarcus has complied a always growing list of #corpgov people to follow on Twitter.